Game Donkey Kong Country 3: Dixie Kong's Double Trouble! Low-G Labyrinth is the twentieth level in Donkey Kong Country 3: Dixie Kong's Double Trouble! It is also the fifth level of Mekanos. This network of pipes is filled with a strange green acid-like gas that lowers the force of gravity throughout the level. As a result, the Kongs' movements and jumps are much longer and slower than normal. For most of the second half, the Kongs play as Quawks. There is also a bonus area where Squawks the Parrot is playable. Many Buzzes and a single Krimp can be found here. As the level begins, the Kongs must bust the DK Barrel, then move onto a challenge of leaping vertically up long pipe sets, finding a red Buzz sitting below the letter K. The next challenge is more vertical leaping, going up past green Buzzes, jumping for the following sides of the pipe as the Kongs advance: left,right, left, and right. The player should then move right to time a leap over three vertically stacked green Buzzes, then defeat a Krimp before going down to the pipe below. 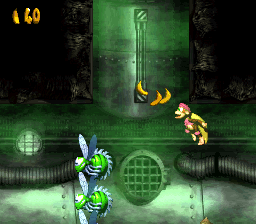 To the right are some Bananas, while to the left is another hole to fall down to find more red Buzz sets to hop on by. This brings the Kongs to a hole where a green Buzz hovers, so the player must time their fall through to go for the ledge on the right, finding the letter O, followed by a back and forth set of ledges to use while dodging all the green Buzzes. Now the player must move right to hop on three green Buzzes, busting the Star Barrel. From here the player finds the Quawks Animal Barrel. They should fly carefully upwards between two red Buzzes, bust the DK Barrel, and then grab the Barrel to drop on a green Buzz, allowing them access to the pipe leading downwards. The player must then grab the Barrel and fly along the roof, killing a green Buzz. Quawks should then fly above the dual green Buzzes to find Banana trails to use as guides as to where to fly to avoid the descending green Buzzes, arriving at the letter N on the left side of the pipe. The bird must then fly up above two green Buzzes, entering a pipe with two red Buzzes to bypass. Quawks must then fly left between two red Buzzes, plucking a Steel Keg from the ground before flying upwards to use it on a green Buzz to get the Red Balloon and Bear Coin it guarded, and then continue the upwards flight path to reach an Auto-Fire Barrel that shoots Quawks past two red Buzzes. He should then grab a Barrel to use on one of the green Buzzes on the left, then fly past the remaining green Buzz to go up to the next pipe where a no Quawks Sign is, turning Quawks into a Steel Keg. Just past here is a pipeline with several green Buzzes, the letter G, and the flagpole. Just before the Kongs get to play as Quawks, there is a stack of three Buzzes. The Kongs can use the team-up move or Quawks to reach the barrel (in the GBA version, Kiddy jumps lower while Dixie is on his back than in the SNES version, thus making it virtually impossible to get in the barrel without losing a Kong, so it's better to reach this barrel as Quawks instead). Here, they are able to play as Quawks. Quawks needs to collect all 80 stars in 25 seconds. If the challenge is completed, the Kongs receive a Bonus Coin. After this area is beaten, the apes are sent directly to the Star Barrel. Just past two red Buzzes, there is a three-way fork. At the bottom is an extremely fast moving Buzz. Quawks must avoid this Buzz, then go down, left, and up until he reaches the Bonus Barrel. In this area, Quawks is transformed into his relative, Squawks. Squawks must defeat the 10 green Buzzes in a time of 40 seconds. when all are defeated, a Bonus Coin appears. After leading Squawks to the No Animal Sign, he turns into a Steel Keg. The monkeys should throw this steel barrel at the wall, while standing on top of Koin. Koin then becomes distracted, making him get hit, granting the apes with the rare DK Coin. This level is similar to Poisonous Pipeline, as both levels are filled with an odd fluid that affects how the level is played. This page was last edited on April 10, 2019, at 14:25.